Proto-Venus rebounded from Jupiter 6000 years ago when a body from outside the solar system impacted the giant gas hydrate planet. The great glowing cloud, many times the size of Jupiter, was ejected with sufficient velocity to escape the gravitational field of Jupiter. As proto-Venus began its first orbit of the Sun the cloud contracted, due to its self gravitation, becoming a brilliant star-like body many times the brightness of any other planet. In a little more than two years made its first perihelion passage. During the passage it was reheated to over 10,000 K by two mechanisms: First, because it was still liquid it was greatly distorted by the tidal force of the Sun. Second, even more significant was the electromagnetic heating due to the interaction of the solar magnetic field with the almost completely ionized proto-Venus. The heat generated resulted in a loss of orbital kinetic energy of the proto-planet. The braking at each perihelion reduced the aphelion on each subsequent orbit. The Rig Veda explains that proto-Venus also had 'innumerable' close encounters with what I call priori-Mars during this period. The net result of these interactions was to eject priori-Mars from its ancient interior orbit, similar to Venus' current orbit, so that it eventually crossed the orbit of the Earth and to further reduce the orbit of proto-Venus. During this period, the flaming proto-Venus passed very close to the Earth on two occasions, scorching and overturning the lithosphere of the Earth. These interactions destroyed most fauna (animal life) on Earth, including millions of neolithic beings living at the time. This marked the beginning of the Bronze Age (BA I). Proto-Venus, priori-Mars and the Earth then engaged in a multistage interaction, resulting in the further reduction of proto-Venus' orbit, so that it no longer reached the Earth. Descriptions of this three-way interaction are present in ancient myths. In addition to the rapid reduction of its orbit, the second important effect of the heating of proto-Venus was to cause the preferential loss of the lighter atoms up to atomic number 20 such as hydrogen, oxygen, carbon, nitrogen, sodium, chlorine, the most common elements blasted from the surface of Jupiter by the great impact. This concentrated the heavier atoms in the body of proto-Venus, gradually increasing its average density. This process was repeated at each perihelion pass for some twenty-eight years, becoming more frequent as the period of its orbit was reduced to less than one year. Because of its great internal heat, this out-gassing by thermal (or Jean's) escape continued for four millennia, evidenced by references to Venus as a 'comet' in the first century BC. The loss of the lighter elements blasted from the surface of Jupiter, which has a density of 1.33 gm/cm3, resulted in a terrestrial body with a density of 5 gm/cm3. The heavy elements such as iron were immediately concentrated in the core and the hot, naturally radioactive elements, thorium, potassium and uranium rose to the surface. This entire process, which was observed by one hundred generations of humans, demonstrates how all terrestrial bodies were formed. This recent high temperature formation of Venus is consistent with its high surface temperature, > 462 °C (736 K / 864 °F) measured by Venera and Pioneer Venus (PV) probes, identical in completely different regions of the globe. The surface rocks are hot enough to melt lead and zinc. Proof that the temperature is driven by interior heat comes from the striking uniformity of this temperature - only one or two degrees deviation from pole to pole and on the day and night sides. Given the Venus day/night cycle of 117 earth days, it is obvious that incident sunlight, which is completely extinguished in the lower cloud layer, has absolutely nothing to do with the surface temperature. The global lower cloud layer, at 48 km over the entire planet, is also driven by the great interior heat. The high surface temperature of Venus implies that the entire interior is molten rock, on which is floating a tenuous crust less than a kilometer thick. The glowing magma interior is actually exposed in myriads of cracks in the thin crust. These are depicted in radar images of the surface, but scientists interpret them as ancient 'lava rivers' that hardened hundreds of millions of years ago, because radar images depict only reflected, not emitted, radiation. Unfortunately none of the probes which sounded the atmosphere were designed to take aerial photographs. The Venera probes took photographs after landing, and the Soviet scientists were surprised to find that the scenes were sufficiently bright that they did not require artificial lighting. Counter to interpretations, this was not sunlight, it was scattered light radiated from the exposed hot lava on the surface. The claim that the illumination was red due to Rayleigh scattering is ludicrous, since this is clear air scattering. The radar images of Venus show a planet covered from pole to pole with volcanic features as a result of its recent catastrophic birth. However, blinded by the assumption that Venus is as ancient as the Earth, scientists currently accept the notion that Venus somehow completely 'resurfaced' itself by 'volcanic overturning' three hundred million years ago. The date is based on the relatively low number of large impact craters per square km - a completely bogus method based on rocks from the lunar maria. Evidence of ongoing volcanism was uncovered in a post facto review of the PV mass spectrometer data, when an anomalous deuterium isotope concentration was detected in a cloud. Because it was so counter to the accepted paradigm, the author actually apologized for his conclusion. 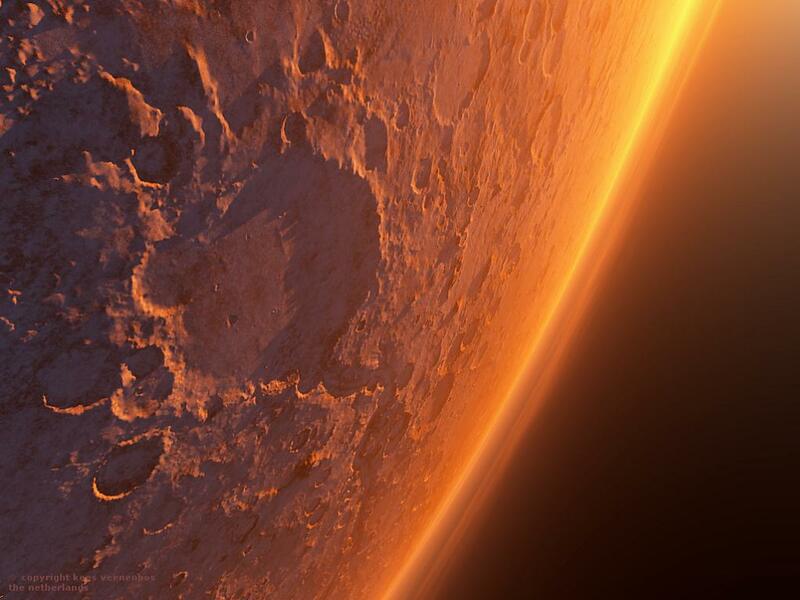 The currently accepted view, published world-wide, is that the surface rocks of Venus are hot because sunlight heats the surface and cannot be re-radiated due to absorption of infrared radiation by the thick CO2 atmosphere. This derives in part from the preconceived notion that the entire 91 atmospheres of surface pressure is due to carbon dioxide - 30,000 times the amount of carbon dioxide in the Earth's atmosphere. But mathematical models based on this assumption have never been able to reproduce the radiation levels measured by the PV probes. There are clues to a cooling mechanism even more efficient than radiation. One involves the most ubiquitous surface features, over two hundred thousand 'small domes.' These are typically two km in diameter with a hole at the top, located in the lowest lying areas, but which have little or no associated lava flows. I maintain that these are active vents through which super-heated gases from the interior are shooting upwards at very high velocities. There are several factors indicating the nature and presence of this gas. It must exist at the very high temperatures in the interior. It was apparently not being sensed by the mass spectrometer, which had over one hundred channels. Although several channels were devoted to sulfur and its common compounds, it only detected a total combined amount of a few parts per thousand relative to CO2. However, at high temperature of interest, the normal form is S8. This is a staggered ring gas molecule with a molecular weight of 256, sometimes called cyclooctosulfur. This allotrope is far beyond the range of the PV mass spectrometer! Furthermore, these staggered rings 'freeze' to form monoclinic crystals, constructed of stacked rings, at exactly the temperature (119.28 C) of the thin cloud layer immediately below the lower cloud (at 46 km). The resulting release of heat carries the crystals still higher where they change to a monoclinic form at 95.5 C. This reaction releases additional heat. The greater density of rhombic sulfur crystals causes them to fall back down into the higher temperature zone, creating a turbulent zone. This is exactly at the lower cloud layer - the single most ubiquitous atmospheric feature on the planet. The PV probes actually saw the turbulence and detected a 20 K temperature offset due to the release of energy at this altitude. PV data also suggested the crystalline nature of the lower cloud layer, but could not determine its composition. Other extremely valuable data from the PV probes was discarded. The infrared sensors on all four PV probes, in completely different regions of the planet, shut down as they descended to an altitude of 14 km (>40,000 ft.) above the surface! The scientists essentially dismissed it as a result of the dilute sulfuric acid that coated the vehicles above 50 km. I maintain that this was a direct result of the intense upward flux of S8from the 200,000 'small domes' on the surface, which coated and shorted out the exposed sensors or their windows. A big surprise came when the PV mass spectrometer, descending through the atmosphere, reached 50 km altitude, where the CO2 and CO channel counts dropped by three orders of magnitude and remained very low until the probe reached 31 km. This data violated two preconceived notions about Venus: that the primary atmospheric constituent is CO2; and that the planet is ancient with a well mixed atmosphere. It was so unbelievable that scientists declared that the sampling port, or leak, had become clogged with a droplet of sulfuric acid and then had later evaporated. The fact that there were two leaks, one five times larger than the other, was glossed over. Just like the discarded radiometer data, this was good data, and deserved more thoughtful consideration. In fact, it is well established that molecular species gradients can occur in a 'mass flow' environment, i.e., where a continuous flow of gases in one direction is combined with a temperature gradient along that path. In Venus' atmosphere, the mass flow is due to high velocity venting of gases, primarily S8, from the interior up to the lower cloud layer. I suggest that rising gases form CS crystals at 31 km, where the atmospheric temperature equals the CS freezing temperature, and these crystal catalyze reactions which capture the carbon, thereby removing CO2 and CO as gas molecules between 31 and 50 km altitudes. This is consistent with the reddish hue sensed by the PV instruments in this range, since CS crystals are red in color. The atmosphere is loaded by the gaseous S8 and its crystals, which form the ubiquitous lower cloud layer. The high pressure at the surface is due to this and not CO2, as currently believed. Thus, as the planet cools and the velocity of the vented gases diminishes, the elevation of the lower cloud layer will decrease and along with it, the high atmospheric pressure. When the 'Hadesphere' finally collapses, the earth-like pressure and temperature just above the lower cloud layer will descend to the surface, beginning a new era for Venus. A new Venus atmospheric probe, launched some 25 - 30 years after PV (1979), may actually be able to determine the rate at which the lower cloud is currently descending, and enable a prediction of when it will be possible to land humans on Venus. If the atmosphere were primarily CO2, as currently believed, the elevated surface pressure would deny human access to Venus for hundreds of millions of years.